1970 Fiat 124 - There's a bit of a debate going on over at the Just a Car Geek Facebook page as to whether this is a Fiat or a Lada. It doesn't matter. Whatever it it, it looks to be a really nice car. Other than needing a windshield and exhaust pipe, it's in incredible condition. As I write this the bidding is up to $4300.00, but the reserve has not been met. Located in Rancho Cordova, CA, click here to see the eBay listing. 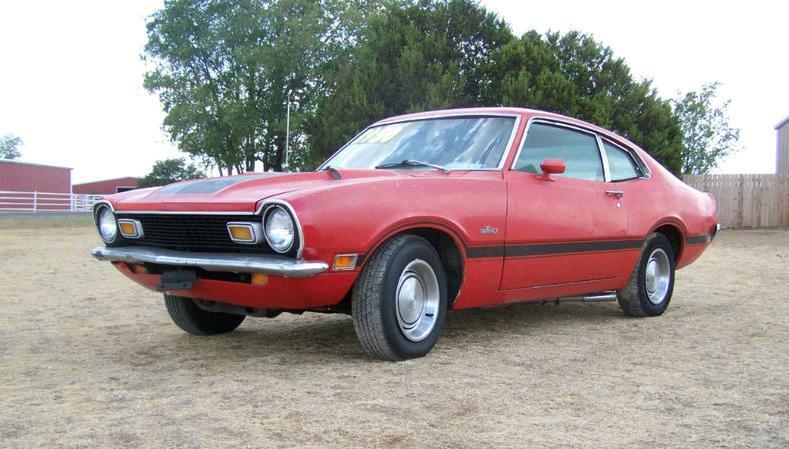 1972 Ford Maverick Grabber - There are few cars as bland as a Ford Maverick. It was built to a price and looked and felt like it. The lone exception was the Grabber version, which, depending on what you ordered, turned the Maverick into a semi-muscle car. This car is an unrestored original. It has a bit of rust and needs a transmission, but other than that, it's a pretty straight forward restoration. Go to any local cruise night and you'll see dozens of Mustangs. When was the last time you saw a Maverick Grabber? This would be a great car for someone looking for a unique piece of American automotive history. Located in China Spring, TX, click here to see the eBay listing. 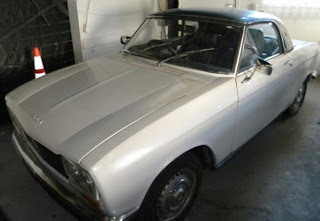 1974 Peugeot 304 Cabriolet - It's not really fair to call the 304 an upscale 204, but I can't think of any other way to describe it, so that's what I'm calling it. Peugeot built sedan, wagon, coupe and, like this, cabriolet versions of the 304. Only the sedan and wagon versions officially made it to the US. They were sold in very limited numbers and for just two years, 1971 and 1972. This car most likely comes from Great Britain as it's right hand drive. The ad has no information, but it looks like this is a well restored or very nice original car. Located in Miami, FL, click here to see the Auto Trader Classics ad. Yeah you aren't kidding about Mustangs being popular at classic car shows. I've gone to a few and it's either old muscle cars or Beetles. A Maverick would be a cool alternative. It reminds me that sometime within the past year I was driving on the road and at a stop light I was right by a green Ford Maverick; I don't know if it was a grabber or not but it looked nice. Hmm... The wagon looks like 90% Lada and 10% Fiat. 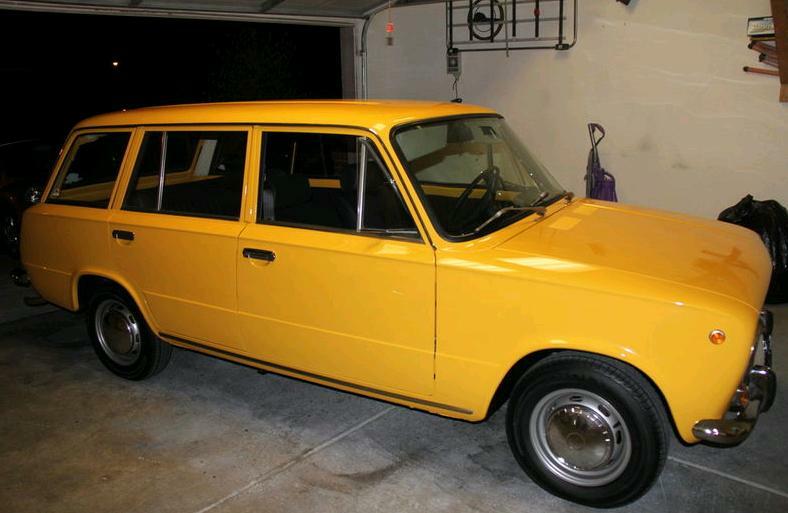 The body is 100% Lada - as Fiat 124 Wagon had different door handles, turn signals, bumpers, and trim. The engine is a Fiat pushrod overhead valve as found in a 124 Wagon, and the front seats look to be Fiat seats. It seems as if someone took a Lada 2102, and swapped a Fiat engine into it. It's definitely a Lada with Fiat bits as opposed to a Fiat with Lada bits. I like that Maverick. I can see myself driving that thing every day to work and the V8 would make it really fun. I had a 72 Mustang with the same 302 and man did that thing go! It got decent mileage as well. The only bad thing about this maverick is the slipping trans, which would be a PITA to fix. I had trans problems with my 72 mustang as well and that ca had only 41,000 original miles. They aren't the most reliable transmissions. That peugot is very cool. They were styled by pininfarina and are stunning. The only odd thing about them is the engine is tiny. You would think a car at this level would have a 2.0 engine, but it is an 1100 or 1300, something like that producing less than 100hp. The car must be very slow.